Born in 2005 in central Italy before recently relocating to Berlin, Slow Motion Records is a label that has firmly established itself in nu-disco circles with just a handful of outstanding releases. Slow Motionʼs eighth release, ʻDeep Electricʼ, comes from Massimiliano Pagliara and Roctiv aka The Rimshooters and is backed by a remix from modern disco legend Fabrizio Mammarella. A name inspired percussive sounds always present on Rolandʼs classic TR Range (and more, pedants) suggests a generally geeky nod towards production but itʼs one The Rimshooters are comfortable with. Their love of arpeggios, acid, the Prophet 5 and the Juno isnʼt something theyʼre shy of admitting either and, as a result, the three originals of the ‘Deep Electric’ EP are liberally scattered with all of the above done with style and a sense of fun(k). ‘Calling You’ leans heavily on excerpts from Answering Service's classic ‘Mr. Telephone Man’, but The Shooters knits it into a brand new, heavier sweater and sends it on its way complete with hypnotic neo-acid and lush strings. 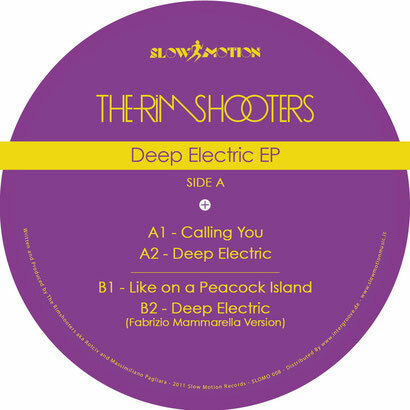 ’Deep Electric’ is exactly as the title suggests and cuts an impressive, synth heavy figure while ‘Like On A Peacock Island’ brings a more mid-80s Italo-vibe to the stage’ Fabrizio Mammarella, a veteran of labels such as Steve Koteyʼs Bear Funk and Brontosaurus, delivers a remix of the title track in an edgy, aggressive but powerfully endearing manner and rounds the package off as a result. It’s out on Slow Motion early February 2012.